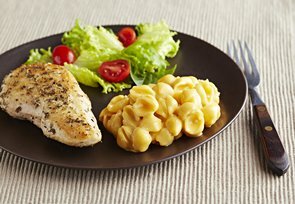 A creamy shells and cheese side dish is served alongside tender chicken breasts seasoned with Italian herbs and garlic powder for a delicious entrée. Combine Italian seasoning and garlic powder; sprinkle evenly over both sides of chicken breasts. Heat oil in large skillet on medium-high heat. Add chicken; cook 5 to 7 min. on each side or until done (165ºF). Meanwhile, prepare Kraft Deluxe Velveeta on Shells Pasta & Sauce as directed on package. Serve Velveeta Shells with chicken. Try serving with a quick bagged salad tossed with your favourite Kraft Dressing. Prepare recipes as directed, substituting 4 boneless pork chops for the chicken, and adjusting the cooking time if necessary until chops are done (160ºF).